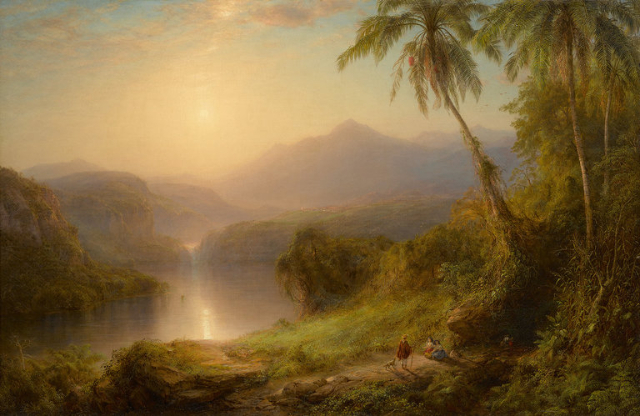 In addition to two works by Norman Rockwell the museum is selling its renowned Hudson River paintings. Initially plans for a “reboot” including $20 million for renovation and $40 million for endowment was met with applause from community, business leaders and the media. An inconvenient truth of all this, presented as an aside by Berkshire Museum director, Van Shields, was that to raise the money it planned to sell 40 works. It disclosed the two top items, works by Norman Rockwell, but initially declined to reveal the rest of what would be cherry picked from 114 years of acquisitions. Now viewed as among his masterpieces "Shuffleton's Barbershop" and "Shaftsbury Blacksmith Shop" in 1959 and 1966, respectively were donated to the Berkshire Museum. In October 2015 as part of the exhibit "Objectify: A Glimpse Into the Permanent Collection" they were shown for what is likely to be the last time. Those familiar with the letter he wrote to the museum say that it was a gift to the people of the Berkshires. In selling these very personal items, donated directly by the artist, the museum may be in legal violation of his implied trust. Accordingly we demand, on behalf of the citizens of the Berkshires, that the museum make public this essential document. The museum has an eclectic collection of 42,000 objects of which approximately 2,400 represent the fine arts. Sources indicate that the works to be sold had been transferred to Sotheby’s, the New York auction house, before the plans were announced with hoopla. In covering the news, including a cheerleading editorial, the Berkshire Eagle was caught looking. Nobody in the news room or editorial board had the interest or expertise to ask tough questions. Only in passing, in language crafted about making tough decisions, was there a hint that the museum was in violation of ethical guidelines for deaccessions. When I quoted chapter and verse from the published and on line protocols of the Association of American Museum Directors the museum lobbied to squash the letter. They informed Eagle editors that they were not members of AAMD and that Shields was not the director of an art museum. The Eagle published my revised letter. The story shifted when the Eagle published an interview with an op-ed poiee by Norman Rockwell Museum director Laurie Norton Moffatt. She has been with the museum for some 40 years which is remarkable. That caused the story to be picked up by national media including a story yesterday in the arts pages of the New York Times. It quoted the ethical guidelines of the AAMD as well as American Alliance of Museums of which the Berkshire Museum is a member. It is acceptable that museums deaccession to cull and upgrade collections. In no circumstance may money from sales be applied to debt, overhead, renovation or endowment. These are the stated intentions of the Berkshire Museum from the estimated $50 million it hopes to earn from the auction scheduled in the next few months. The Eagle has posted almost daily reports by Carrie Saldo who has been digging ever deeper into the story. Under pressure from the media, on Monday, the museum released the full list of works to be sold. Heads turned when it included Hudson School paintings, beloved works by Calder, other modernists, plus odds and ends of Old Master and Asian art. Initially announcing a shift away from the fine arts to focus on history and science questions have arisen regarding the status and security of works by living artists. Among others it owns works by Gregory Crewdson, a photographer who has used Pittsfield for a locale in his work and painter, Stephen Hannock, who directly links to the landscapes of the Hudson River School. Their works sell for six figures. With hindsight it may have been a strategy of the museum and its board not to include works by living artists and donors. The works to be auctioned were given decades ago and appear to have no restrictions. The attorney advising the museum in this matter is C. Jeffrey Cook of the Pittsfield based firm Cohen Kinne Valicenti & Cook LLP. He is an honorary trustee of the museum. While Shields has said that the museum can't afford a curator, resulting in mediocre and enervating programming, it has spent a fortune on a two year study, legal advice and marketing of the selloff. It states that some 400 idividuals were consulted but made no direct appeal to artists, arts professionals or individuals with interest in supporting a fine arts museum. The norm would be to lauch a capital campaign, and exhaust donor resources, before the drastic decision of selling its signature works. When a church is deconsecrated the relics are removed. After that it is just a building with stained glass windows. Similarly, Shields and the trustees are ripping the spirit and soul out of the museum entrusted to their care and preservation. Moving forward with controversial deaccessions it is likely that the case of the Rose Art Museum of Brandeis University was carefully considered. Back in 1962, the founding director of the museum, Sam Hunter, had $45,000 in seed money to purchase some 25 works by then emerging pop and abstract artists. In 2009 Jehuda Reinharz, backed by the board of trustees of the university, fired Rose museum director, Michael Rush, and moved to close the museum and sell the collection. By then it had an evaluation of some $350 million. One assumes that the value has risen since then. The response from alumni was mixed, just as it is in Pittsfield. Some expressed that cash strapped Brandeis might find better use of that money than maintaining a museum that draws about 25,000 annual visitors. Underwhelming visitation and mounting deficit, about a million plus a year for ten years, are similarly potent arguments for the Berkshire Museum. Other alumni, I am a graduate of the class of 1963, felt it was a betrayal and outrage. As is happening now with the BM it escalated into national media coverage. If Brandeis could close the Rose, and Berkshire Museum can sell key works with impunity, that sets precedents for every cash strapped museum, school, library and public institution in America. Should the BM sale go through, despite professional sanctions and protests from community and arts leaders, that may well open the floodgates for works sold to fix the roof or establish endowments. It also sends a deep chill through all artists and collectors contemplating making donations to museums. On February 5 , 2009 Reinharz posted a letter. The past ten days have been extremely difficult for all of us. I have heard from many of you and listened carefully to your criticisms and constructive suggestions. I have read every message on the faculty list serve, and the thoughtful letter sent to me by a group of faculty last night. I have also heard from students, staff, alumni, university presidents and complete strangers about my statements regarding the vote by the Board of Trustees concerning the Rose Art Museum. In retrospect, I wish I had handled the initial statements I made in a far more direct way. Unfortunately, those statements did not accurately reflect the Board’s decision authorizing the administration to conduct “an orderly sale or other disposition of works from the university’s collection.” The statements gave the misleading impression that we were selling the entire collection immediately, which is not true. The University may have the option, subject to applicable legal requirements and procedures, to sell some artworks if necessary, but I assure you that other options will also be considered. The Museum will remain open, but in accordance with the Board’s vote, it will be more fully integrated into the University’s central educational mission. We will meet with all affected University constituencies to explore together how this can best be done. I regret as well that I did not find a more inclusive and open way to engage the Brandeis community in the deliberations that led to the Board’s decision. Having learned from this experience, I will do my best, as will the entire administration, to work together with all of you in a collaborative manner. We must cooperate as we move forward to confront our financial crisis. But we also have to take bold steps. Obviously, we have many tasks ahead of us regarding the curriculum and the budget. In meetings with members of the faculty and with students in the past few days, I have been heartened by the enormous reservoir of good will, imagination and willingness to work hard to guarantee that Brandeis will continue to thrive as a first-rate institution of higher learning. Van Shields would be well advised to peruse this letter as he has made similar mistakes and miscalculations. The most egregious ones were failing to acknowledge that the museum was in deliberate violation of ethical guidelines. Secondly, it was ill advised not to make full disclosure of works included in the sale. For many in the community its Hudson River paintings and Calders are as much beloved as the two paintings by Rockwell. Not disclosing them has added gasoline to the fire now that they are revealed. Initially it seems that Shields calculated that they could pull a fast one. The museum assumed that there will be no blowback about works from long deceased donors. We demand, however, that the museum release its Rockwell letter. The people of the Berkshires deserve to know the heart and soul of the artist’s intention. Norton Moffatt has assessed the works as among his best. Like the Brandeis works bought for just $45,000 in the 1960s, the Rockwells had relatively little market value when he donated them. Now they are collected for multiple millions by Steven Spielberg, George Lucas and others. An interpretation of the Rockwell letter may provide grounds to seek an injunction against the sale of those works. That puts pressure on Sotheby’s for selling museum based works in violation of ethical guidelines. As media pressure increases that generates negative publicity for the renowned auction house. It has been known to withdraw from sales when there are questions about provenance, attribution, and professional ethics. While the sale is likely to move forward it is possible that bad karma may result in not reaching the estimate of $50 million. This yard sale of treasures is a black eye for the arts in the Berkshires. In recent years the economy has shifted from industry and manufacturing to cultural tourism. Now a key player in that hegemony is behaving badly. Other than Norton Moffatt, relatively few arts leaders have taken a stand or spoken on the record. Perhaps they are waiting for the other shoe to drop. If you know any of these individuals we urge you to talk with them. "To sell off the Hudson River School and the Norman Rockwell paintings is to walk on the heart, fabric, and pulse of the Berkshires." "Walter Annenberg led the charge in the move of the Barnes Museum from Merion, Pa. to the Benjamin Franklin Parkway in downtown Philadelphia. Yet, when he left his own art to the Metropolitan Museum in NY, he made sure that no work would ever be sold or moved. After violating Barnes' intention, he made sure that his own was protected. Rockwell is the Berkshires. He belonged here and he wanted his work here. Go, Charles, Go. Beat the philistines back." "Makes me think of the Rose Museum at Brandeis U. Until pressure from students, alumni, faculty and parents convinced the Rose by addressing the irresponsibility on the part of the school WITH AN ART DEPT, finally turned the decision around." "Has this gone to the Boston Globe? Please. The most succinct summary of the Berkshire Museum "situation" I have read. Oh yes, and every public media source you can think of." "Read your piece with great interest and subsequent outrage, notwithstanding that I have been following the issue as it has been reported elsewhere in the press. However when I came across the name of C. J. Cook, I understood a great deal more. To anyone intimately connected with the PCB-Housatonic issue during the past 20 years, Cook's name is synonymous with G.E. 's, a defender of their actions and positions, someone who has and continues to be opposed to the cleansing of our river and the environment as being unnecessary, too costly, unfair to G.E., an industry shill, oblivious to the longterm needs and benefits of the many (including the River and its environment) and in favor of the pleasures and monetary preferences of the few (members of the oligarchical minority in Pittsfield). If I were asked to pick out Pittsfield residents who exhibited sympathetic awareness about or affinity with a creative mindset, his name would be last. His presence leaves a bad taste in my mouth." "Charles Giuliano is on fire! Righteous indignation, justifiably so." "The attorney advising the museum in this matter is C. Jeffrey Cook of the Pittsfield based firm Cohen Kinne Valicenti & Cook LLP. He is an honorary trustee of the museum. While Shields has said that the museum can't afford a curator, resulting in mediocre and enervating programming, it has spent a fortune on a two year study, legal advice and marketing of the selloff. "" "This is the most comprehensive explanation of the dubious nature of this self-off yet. Thank you." "Giuliano is correct! People must act quickly! Ps: BM differs from the Rose Museum because our art belongs to the region and not to the university. Perhaps that is where we should make our case as well." ""Nobody saw it coming" is right. Where are the paintings now? If they are at Sotheby's then Jeff Cook has to be the one who greased the legal skids, so to speak, for that to happen. He's an honorary life member of the museum. It's not going to be much of an honor after the looting of the collection turns a great little museum into a stupid, boring venue for further distracting already distracted kids with the latest PC "scientific" "interactive" displays, whatever that means. I imagine it means gizmos which will have to be continually replaced because no one will come back to play with them a second time. I have seen the great landscape paintings many times and I never tire of looking at them. Van Shields sees them only as easy money. How could the board not have talked about it with friends and colleagues? How did they keep it from the eagle eyes of the Berkshire Eagle? How did Van Shields browbeat the board members to not leak? How could a Crane be party to the desecration of the vision and wisdom of his forbears? Van Shields tells us that he expected a reaction. Did he imagine the NYT would take a pass on the ethical issues, the way the Eagle did? Did he imagine Terry Teachout would praise him in a national newspaper, the WSJ, for his cleverness? Hey, you activists protesting the cutting down of a few acres of trees for a pipeline, why aren't you camped out in front of the museum to protest the cutting down of something that will never regrow once it's gone? One could go on and on for a righteous cause but it is wearying, even you, Charles seem a little resigned that Van Shields and Jeff Cook and the board of enablers might get away with it. They must not get away with it. AAARGH!" "That the works in question may already have been removed from the Museum speaks to the demonstrated arrogance of Van Shields. He may see himself as a knight come to rescue the Museum, but in reality he is a Hun come to pillage it."